Restore, protect, and colorize outdoor fabric furniture with Waterproof Outdoor Fabric Paint. 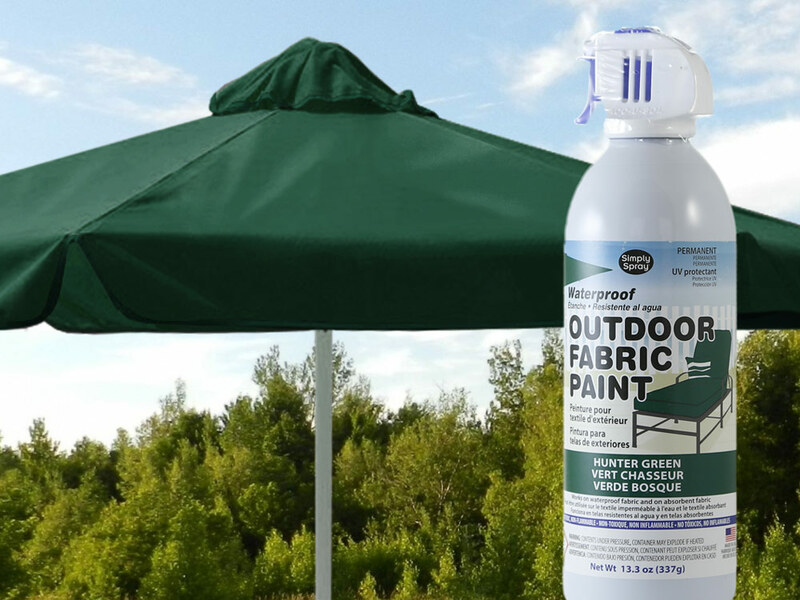 Outdoor Fabric Paint is a waterproof, non-toxic, non-flammable aerosol paint for use on outdoor furniture and items that need to survive the rigors of weather. The paint is permanent, fast-drying, and safe to wash and dry (it is recommended to wait 72 hours before washing). 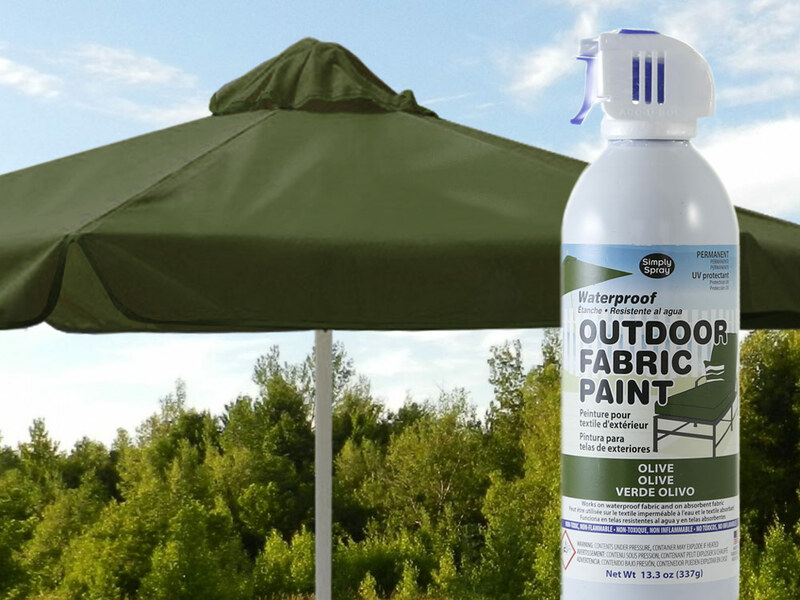 Outdoor Paint provides thick coverage and leaves a vinyl-like feel to the fabric. It is best suited for patio umbrellas, marine canopies, bimini tops, awnings, and more. For outdoor furniture and cushions, we highly recommend upholstery paint instead of waterproof outdoor paint. This is a fabric paint like no other. Its non-toxic formula air dries, so there is no need to heat set it. It allows you to paint fabrics without needing to wash out excess dye. Now you can spray paint fabric that is faded, outdated, or ugly. 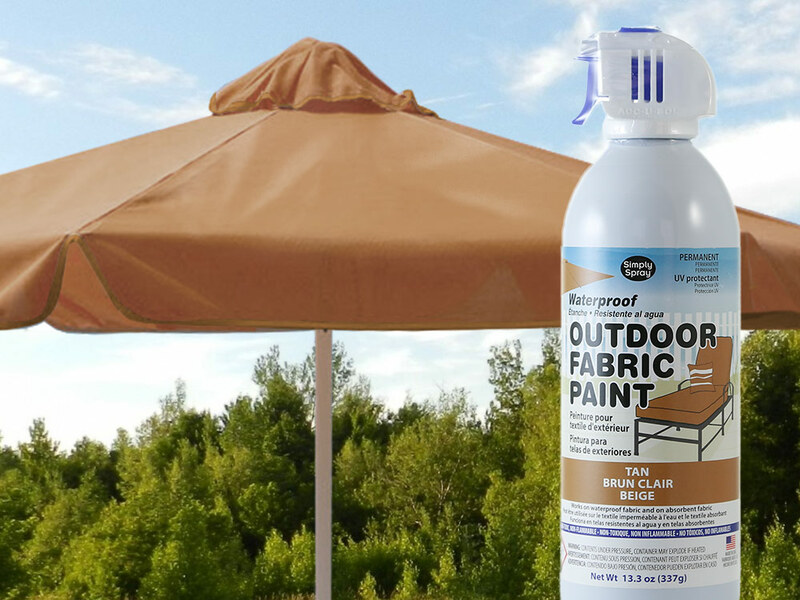 Spray it new again with Simply Spray Fabric Outdoor waterproof Spray Paint. Please see our Projects page for projects done by our customers. For best results, let dry for one to two hours before spraying another coat to achieve the desired color. Save money and preserve the environment by giving new life to your old outdoor furniture, boat seats, garden umbrellas, awnings and patio cushions. This is a specialty paint and may not be suitable for all applications. If you are unsure of which fabric paint formula is best for your specific needs please do not hesitate to contact us so we can help you get the right fabric paint for the right job. We are happy to help. Each of our paints have different qualities and we are happy to explain the differences to you. Outdoor Waterproof Fabric Spray Paint in made right here in the United States of America. Rhode Island to be exact.